by Caroll Michels. Allworth Press, revised 2018. Click to order from Amazon.com and Save! by David Bayles and Ted Orland. Image Continuum Press, 2001. Explores the way art gets made, the reasons it often doesn’t get made, and the nature of the difficulties that cause so many artists to give up along the way. by Barbara Markoff. PFM Books, Morganville, NJ, 2010. 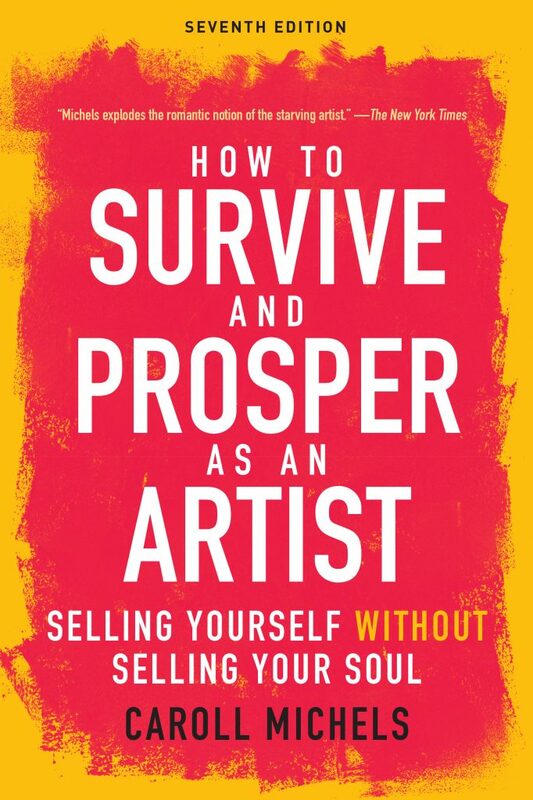 Although written for art consultants and those who want to enter the field, this book provides good ideas on art marketing that will be helpful to artists. The chapter “Working with Artists” will also be of interest. by Tad Crawford. New York: Allworth Press, revised 2014. Contains ready-to-use forms with detailed instructions, including artist-gallery agreements, and contracts for sales, commissions, and limited editions. Includes a CD-ROM to print out the various forms. by Susan Abbott. New York: Allworth Press, revised 1999. Although directed at art consultants and gallery owners, artists will find much of the advice helpful, such as how to generate leads and reach decision makers in the corporate art field. by Ellen Liberatori. New York: Allworth Press, 2006. Provides artists (and arts groups) with information on facts and skills needed for grants applications in the arts, including formulating budgets, mastering the intricacies of the application process, online resources and application opportunities, insights into understanding the selection and review process, and more. by Tad Crawford. New York: Allworth Press, revised 2010. Covers copyright, contracts, sales, taxation, estate planning, and many other legal issues of importance to artists and their work. The new edition includes a discussion of new media and electronic rights. by Caryn R. Leland. New York: Allworth Press, revised 1995. Contains advice on how to license creative images with information on protecting ideas using copyrights, patents, and trademarks; maximizing royalties; finding manufacturers and distributors; and licensing in cyberspace. Includes a model licensing agreement. Licensing Photography Book Coverby Richard Weisgrau and Victor S. Perlman. New York: Allworth Press, 2006. Written by a photographer and intellectual property attorney. Provides advice on writing licensing agreements, prices the value of licenses, and how to successfully negotiate fees. by Gail McMeekin. Conari Press, 2011.
by Tad Crawford and Susan Mello. New York: Allworth Press, revised 2008. Provides guidelines for sound business negotiations and resolving disputes. Includes a chapter on consignment legislation, and the texts of the art consignment laws enacted in more than 31 states. by Monona Rossol. New York: Allworth Press, revised 2001. Everything you need to know about safe and unsafe art materials, and comply with the United States and Canadian right-to-know laws. by Gigi Rosenberg. New York: Watson-Guptill Publications, 2010. Empowers artists with the tools they need to find and win funding. Includes time-tested strategies, anecdotes from dozens of funded artists, and tips from grants officers and fundraising specialists. Covers every aspect of writing a winning grant application including how to research funding, build a team of support, and overcome psychological roadblocks. Click to order Kindle version from Amazon.com and Save! by Lynn Basa. New York: Allworth Press, 2008. Provides guidance on how to start and build a career in public art. Includes information on finding, applying for, competing for, and win a public art commission.